This is it. If you’re going to put all your eggs in one basket, you might as well do it on Easter weekend. Had his final Florida Derby tuneup with a half in :49 2/5. It’s simple: first or second and he’s in; third and he’s in danger of being excluded. Let’s just hope he has a clean trip and there isn’t a three-way photo to sweat out. He’s already secured a spot in the Derby; now it’s time for a little gut check and to put some bottom under him. Worked a half in :49 3/5, but DRF had him “galloping” out in 1:01 2/5, up in 1:13 2/5. Those are :11 4/5 and :12 eighths and horses don’t gallop out a quarter in :23 4/5, so that was more like a 6f work. It was exactly what he needed – slow early and fast late and a good tightener. Time to find out just how special this colt really is. Here is another top-ranked colt who must deliver, but he has to do it in a big field over a foreign surface against some talented locals and a tough stablemate. He’s had a habit of finding trouble through no fault of his own, and this definitely is not the time to continue that trend. Officially worked a half in :48 1/5 with Overanalyze, but more like 5f in 1:00 3/5. He will go into the Derby off one race in 13 weeks, while stablemate Shanghai Bobby will have one race in 14 weeks. We obviously won’t know until Derby Day how effective this conservative approach will be. The one positive is that both colts at least have a decent 2-year-old foundation. Perhaps Pletcher will have them peaking on the first Saturday in May, as I’ll Have Another did last year. No pressure on him at all in the Florida Derby. He already has enough projected points and with his style of running, he only needs to be closing at the end to set him up for the Derby. If he wins, fine. Knowing McGaughey, he’s more interested in having him peak on the first Saturday in May, and the way he’s been progressing with each race he seems ready to do just that. His overall record does not begin to do him justice. In his four 2-turn races he’s drawn post 10 twice and 11 once and got hung very wide all three times. The only time he drew a good post he won by 11 ½ lengths. His two worst finishes, well-beaten 4ths, were on a synthetic surface, and in his career debut he was pulled up and vanned off. So, his record on conventional dirt is 5 starts, 2 wins, a second, a third, and a fourth (beaten a half-length). In 8 starts, he’s been ridden by 6 different jockeys. Oh, yes, he’s already won at Churchill Downs by 4 ¾ lengths in 1:22 4/5 for 7f. His Thoro-Graph figs are very strong. From 2 to 3, he improved from an 8 ¾ to a 2, then paired up the 2, and then improved to a 1 ¼. No one has put together 3 consecutive figs this strong. All this adds up to a very live horse. He looked super working 5 furlongs in :59 flat in company, galloping out way ahead of his workmate, and he just kept going well down the backstretch. The more you watch the Gotham the more you have to be impressed with his stride and powerful closing punch, and that was not even his style of running. Now he steps up in class in the Wood and we’ll see what he can do against Verrazano and a desperate Normandy Invasion. I keep bouncing back and forth where to put this horse. Winning the Derby off only two 2-turn races and two 6-furlong sprints is not an easy task. But Hollendorfer is one trainer you know will have him as fit as possible. We’ve seen that explosive late burst of speed sprinting and two turns. One more time and he has to shoot up the list. What makes him so perplexing is his lack of racing combined with an acceleration that is rarely seen. If those moves were real and not an illusion, then he has the potential to be something special. Worked 5 furlongs in 1:00 4/5 in company with Palace Malice. Strategy is going to play an important role in the Florida Derby and he has to show the ability to adapt to any pace scenario that may confront him. The big question is, do you go all out to win this race even if it’s on the lead or do use it to teach him how to settle off the pace and close? He did close his final quarter in :24 1/5 in the Champagne, so we know he can come home. This could become a cat-and-mouse game with Itsmyluckday. The wrong move and Orb could swallow up both of them. But Rosie knows this horse so well and she’ll put him where he needs to be. Looking over the Future Wager horses for a potential bargain, he was the one who jumped off the page at 42-1, which very well may look like the overlay of the year after next week’s Louisiana Derby. The way he’s been working and how much room for improvement there is off the Risen Star, there is no reason he shouldn’t run a big race. One of the best angles on the Derby trail this year is the fact that he was the only horse in the Risen Star making his two-turn debut, he had only three career starts, and had only one seven-furlong race in almost 7 months under his belt. There was no way he was anywhere close to 100% wound up for that race, and he still was beaten only a half-length and out-battled Oxbow for the show spot. He has the pedigree to go long and has been training super, working 5f in 1:00 4/5 in company with Shanghai Bobby. That’s the kind of 42-1 shot I want in the Future Wager. If he can get through a tough Louisiana Derby unscathed, watch out in Louisville. Like Verrazano and Hear the Ghost, he is light on racing experience with only four career starts, but he at least got a stiff test in the San Felipe and emerged a stronger Derby horse than he was before when had only two easy victories to his credit. As long as he doesn’t do anything to hurt his chances, like he did last time by engaging Goldencents early, he should be a tougher opponent in the Santa Anita Derby. The question is, did he just get tired late in the San Felipe or did Hear the Ghost turn on the afterburners in the final sixteenth? He continues to train sharply for his big Derby push in the Wood Memorial. He followed up his :59 3/5 drill last week with a bullet 1:00 1/5 work, fastest of 30 works at the distance. You know he’s going to be flying at the end, but the main question is whether he’ll have a clean trip and doesn’t encounter the problems he did in the Risen Star. Those problems, mostly at the start, likely cost him enough to points to at least provide some breathing room going into the Wood. But again, when you have only two preps, you better make the most of both of them. With that big long stride of his and his ability to gut out close finishes, he’s always going to be dangerous, as long as he gets a track he can handle. Because of his stride, he most likely never got hold of the slop in the Southwest. He’s already won over Keeneland’s Polytrack, breaking his maiden there last year, so the Blue Grass should be a good prep for him, especially considering he’s already in the Derby field and just needs a good tightener to move him forward. Have to get this out of the way first. Although it has more to do with the Oaks than the Derby, was someone at The Jockey Club sleeping when they approved the name WAR RELIC for a 3-year-old filly? Have we lost touch with history to such a degree that a horse can be named after the most successful son of Man o’War at stud, whose remains along with Man o’War and War Admiral were moved to a place of honor at the Kentucky Horse Park? If this were Twitter, I would end this with #Blasphemy #Disgraceful. Also, a mention must be made of Rob Whiteley, for years one of the most successful breeders in the country, who was responsible for dozens of grade I winners while operating his Liberation Farm on a much smaller scale than the major breeding operations. Whiteley no longer was able to overcome the breeding industry’s many economic pitfalls and was forced to liquidate his entire stock and retire as a Thoroughbred breeder. While it is sad and scary to think that someone as astute and successful as Whiteley could be driven to such an extreme by the banks, he at least was able leave the sport with a heckuva going away present as breeder of 3-year-old stakes winners ITSMYLUCKYDAY, RYDILLUC, and Saturday’s Rushaway winner CROP REOPRT. It is hoped that these three talented colts can keep Whiteley’s name up near the top of the leading breeders list – a place he occupied for many years. Speaking of Rydilluc, even if I wanted to bet him in the Future Wager, I couldn’t, because he’s not among the 23 individual betting interests. Nothing against Noble Tune, but why is he on there and not Rydilluc? Noble Tune has only a head allowance victory on grass this year, while Rydilluc has two runaway grass victories, including the grade III Palm Beach Stakes. Have to admit, I don’t get that one at all. I’m also curious why Noble Tune is on there instead of Gotham runner-up West Hills Giant or fast-closing San Felipe third-place finisher Tiz A Minister, who was beaten a length by leading Future Wager contender Hear the Ghost and a half-length by Flashback? Noble Tune could turn out to be a terror on Polytrack and on dirt, but at this time I don’t know what he’s done this year to get on the list of betting interests over the aforementioned horses. As for the weekend races, BLACK ONYX and UNCAPTURED both stamped themselves as legitimate Derby horses, mainly because they have already proven themselves on dirt and their performances in the Spiral Stakes indicate they should improve next time out. Both colts were very late changing leads and Uncaptured didn’t change until almost at the sixteenth pole. He just seemed uncomfortable on that track coming down the stretch and you have to give him credit for finishing a strong second over a deep synthetic track going 1 1/8 miles off a four-month layoff and physical problems. It is a difficult task for any 3-year-old to just return at 1 1/8 miles off a layoff over any kind of track, but to do it on that kind of surface says a great deal about the colt, who should be much stronger and fitter with this race under him. Once he did change leads in deep stretch, he was striding out much smoother to the wire. 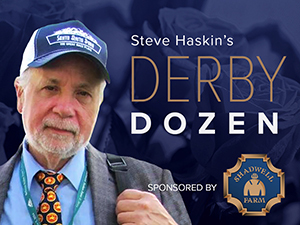 He does have back-to-back stakes scores at Churchill Downs, so all he needs to do is pick up a minimal amount of points in his next start to assure he makes it into the Derby field. He may be in already with 30 points and almost $400,000 in stakes earnings. Black Onyx is now in the capable hands of Kelly Breen, who has saddled the Rock Hard Ten colt to two victories in as many starts. Although he finished a well-beaten fourth on the dirt at Gulfstream, he does have a victory at Aqueduct and a second at Belmont last year in off-the-turf maiden races. What made his performance in the Spiral so impressive was how wide he was for the entire race, especially going into the first turn and down the backstretch. So, he, too, will get a lot out of this race. Next stop Louisville. At Sunland Park, Bob Baffert struck again, sending out the lightly raced GOVENOR CHARLIE to a five-length score in the Sunland Derby. The son of Midnight Lute, who is improving dramatically, but still has only three career starts, set a new track record of 1:47 2/5. So, does Baffert and Mike Pegram send him to the Derby with so little experience and having only won a grade III stakes at Sunland Park? The temptation is there for sure after such a dominating score, but it is asking a lot of the colt. From a visual standpoint, the most imposing colt seen all weekend was CROP REPORT, who came from far back in last to blow away his opponents in the Rushaway Stakes at Turfway. Physically, this is the closest thing to Forego seen in many years, in size, color, stride, and even the way he sweeps around horses on the turn. He is spectacular to look at, especially in action where he dwarfs all the horses around him. Unfortunately, he is a May 31 foal and is not there mentally yet, so owner Team Valor will point him for the Belmont Stakes, with a likely prep in the Peter Pan. Like Forego, he should relish those big turns at Belmont. One of the best works of the week was the 1:12 3/5 six-furlong drill by GROUND TRANSPORT, who rattled off his eighths in :12 2/5, :11 3/5, :11 4/5, :12 1/5, :12 1/5, and :12 2/5 in preparation for the Louisiana Derby. Also working for the Louisiana Derby were stablemates DEPARTING and SUNBEAN, who went their halfs in :47 1/5 and :48 1/5, respectively. Some other works of interest include Florida Derby hopeful FRAC DADDY, who drilled five furlongs in 1:00 1/5, out in 1:13 1/5; SPEAK LOGISTICS, who went a half in a bullet :47 1/5 for the Blue Grass Stakes; and ELNAAWI, who tuned up for the Wood Memorial with a five-furlong breeze in 1:02 2/5 over the Belmont training track. Also working for the Blue Grass was the aforementioned RYDILLUC, who breezed an easy seven furlongs in 1:30 on the turf.